Background: Models that predict changes in the abundance and distribution of fauna under future climate change scenarios often assume that ecological niche and habitat availability are the major determinants of species’ responses to climate change. However, individual species may have very different capacities to adapt to environmental change, as determined by intrinsic factors such as their dispersal ability, genetic diversity, generation time and rate of evolution. These intrinsic factors are usually excluded from forecasts of species’ abundance and distribution changes. We aimed to determine the importance of these factors by comparing the impact of the most recent climate regime change, the late Pleistocene glacial-interglacial transition, on two sympatric, ice-dependent meso-predators, the emperor penguin (Aptenodytes forsteri) and Weddell seal (Leptonychotes weddellii). Methods: We reconstructed the population trend of emperor penguins and Weddell seals in East Antarctica over the past 75,000 years using mitochondrial DNA sequences and an extended Bayesian skyline plot method. We also assessed patterns of contemporary population structure and genetic diversity. Results: Despite their overlapping distributions and shared dependence on sea ice, our genetic data revealed very different responses to climate warming between these species. The emperor penguin population grew rapidly following the glacial-interglacial transition, but the size of the Weddell seal population did not change. The expansion of emperor penguin numbers during the warm Holocene may have been facilitated by their higher dispersal ability and gene flow among colonies, and fine-scale differences in preferred foraging locations. 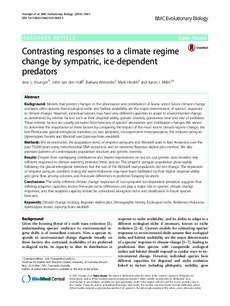 Conclusions: The vastly different climate change responses of two sympatric ice-dependent predators suggests that differing adaptive capacities and/or fine-scale niche differences can play a major role in species’ climate change responses, and that adaptive capacity should be considered alongside niche and distribution in future species forecasts.